I’m super sorry, Dustin Welbourne writing for The Conversation, but yes. Reptiles are still a thing, and I gotta tell you why. the group of animals we refer to as “reptiles” does not exist – at least not anymore. As he correctly explains, phylogenetic nomenclature (the process of naming groups of life based on their evolutionary relationships) says that each line on that diagram gets a name. Because of the group-within-group relationships of life, these names then apply “branch-ward”; in the case of this figure, they apply everywhere to the right of the name. 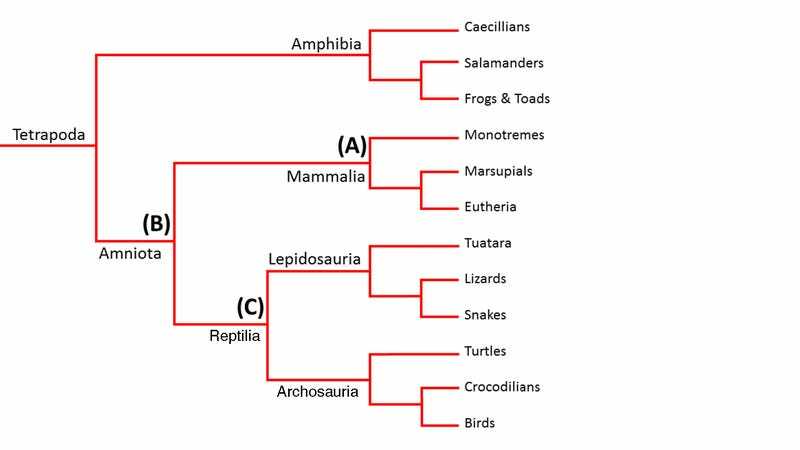 So every form of life on this cladogram is a member of Tetrapoda; they’re tetrapods. The three groups to the right of the node marked (A) are members of Mammalia; they’re mammals. All of the groups to the right of the node marked (B) are members of Amniota; they’re amniotes. Within Amniota, there’s two big groups of extant, or living, amniotes. There’s ourselves and all our mammalian kin. To be more accurate, our group is called Synapsida, since there’s a bunch of Carboniferous, Permian, and Triassic mammal relatives who weren’t mammals, they’re synapsids. And there’s our sister group, which Mr. Welbourne’s illustration labels as (C). Now, Mr. Welbourne does correctly point out that one definition of Reptilia (the group containing all reptiles) is paraphyletic. Imagine you have multiple children and grandchildren. You and all of your children and all of your grandchildren are a monophyletic group: you are a group consisting of a common ancestor (you) and all of its descendants (your children and grandchildren). If you excluded some of your children or grandchildren from consideration, you would now be discussing a paraphyletic group: this group does not consist of a common ancestor and all of its descendants. Mr. Welbourne correctly points out that, in phylogenetic nomenclature, scientists try to minimize their discussion of paraphyletic groups. This is why birds are dinosaurs; birds are a branch of the dinosaur family tree, and talking about “dinosaurs” without talking about birds is talking about a paraphyletic group. So, if we are to consider all animals from junction [C] onwards as reptiles, then we must also label birds as reptiles. Well, yes. 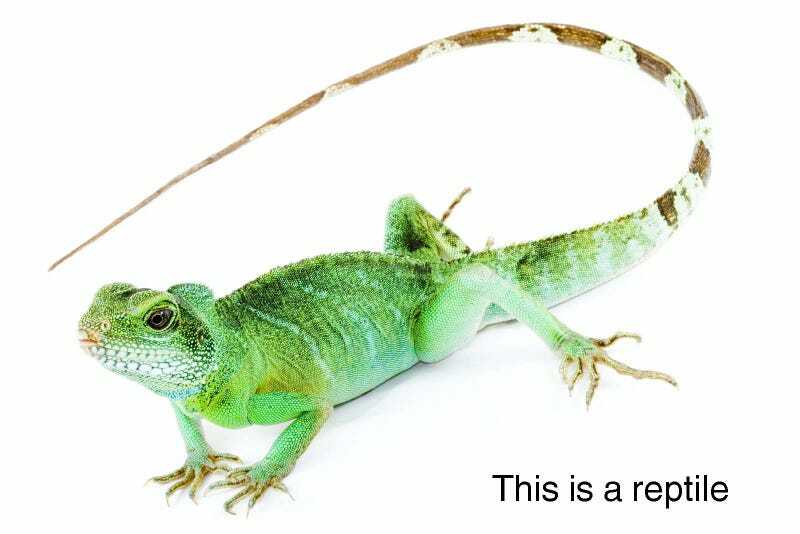 Following phylogenetic nomenclature, all animals from node (C) onwards, if node (C) is labeled Reptilia, would be reptiles. So birds are reptiles, just like birds are dinosaurs. Why can’t we do this? We could do this I guess, but it would be redundant. The group of animals from junction [C] onwards are already referred to as sauropsida. Oh… well… that’s another misunderstanding. In phylogenetic nomenclature, each node or branch of a cladogram can have a name. When more than one name has been proposed for a node or branch, two main criteria are used for deciding which name should be kept in scientific discussion. Priority is why we have Apatosaurus instead of Brontosaurus. Two names for the same thing were proposed, and the older of the two names gets priority, unless a strong argument for ignoring priority can be made. Conservation is why the wildcat (the species which domestic cat sprang from) is called Felis silvestris instead of Felis catus. As would be expected, scientists gave species names to domesticated animals before they gave them to their wild ancestors. Then, for the better part of 2 or 3 centuries, scientists referred to the wild animals (e.g., Felis silvestris) and the domestic animals (e.g., Felis catus) as different species. With a more modern understanding of how evolution and biology work, we recognize that the wild species and its domestic descendants are one group, which is most properly named with the wild species name. Scientists conserved the name of the wildcat species, because it’s been frequently used by scientists, rather than getting rid of it for the sake of priority. Reptilia is an older name than Sauropsida. That makes Sauropsida a junior synonym for Reptilia. If Sauropsida was more commonly used in the scientific literature than Reptilia, then a case could be made for throwing away the word Reptilia. It hasn’t been, and people have done the work to argue why Reptilia should be retained and Sauropsida should be kind of ignored. Reptiles, as a scientific term, is every animal that is part of Reptilia. Yes, we could instead use the term Sauropsida, and call every animal within that sauropsids, but no one has persuasively explained why scientists should do that. But John and Jane Doe don’t think birds are reptiles! So? Scientists can keep using the term reptiles to mean “all animals more closely related to one another than to any mammal or mammal ancestor”. If the public wants to use that definition, then that’s their choice. If the public would rather use the definition “snakes, lizard, turtles, and crocs”, then that’s their choice. That’s okay, because science doesn’t stop being right if non-scientists use the same words to mean different things. There’s plenty of issues wherein scientific knowledge and the general public knowledge are deeply divided. Scientists are pretty sure that humans are causing modern global warming; the general public thinks that’s not true. That’s an issue worth worrying about. That “my barber thinks birds aren’t reptiles!” isn’t something worth worrying about. Top image adapted from here. That website identifies that reptile as a green basilisk lizard (Basiliscus plumifrons) but I think it’s a Chinese water dragon (Physignathus cocincinus) so if anyone can confirm one or the other I’d be happy. Hat tip to IFL Science for re-hosting Mr. Welbourne’s article to a larger audience. Hat tip to the commenters at both The Conversation and IFL Science who also spent time explaining why Mr. Welbourne’s article has some major mistakes in it.